More often than not, we only remember gutters when they are having problems. When the rainy season comes, gutter leaks, gutter overflow, and blockage is a very common sight. By then, it may be too late to do the work needed to fix the problem. The function of a guttering system involves proper draining of rainwater as it falls down from your roof, into the downpipes, and finally down the drain. This exposes the gutter into a lot of weight all year round. Rain and snow can pile up and put significant stress on your gutter, especially if does not have an efficient draining in place. Furthermore, leaves, twigs and other debris may also pile up, adding unnecessary weight to the system. To hold the gutters in place, you need to have well-placed gutter brackets that can support them. Gutter brackets, also known as gutter clips or gutter hooks, secure the guttering system into the building. They help bear the stress due to weight from rainwater, snow, leaves and other debris. 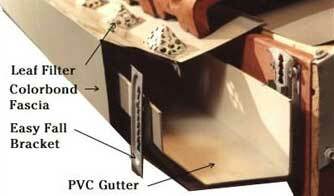 There are several types of gutter brackets that you can use for your gutter. The type that you need to use depends on the type of guttering that you want to have for your home. A gutter system with larger capacities will carry a heavier load of water compared to smaller ones. The most common type of gutter bracket is the fascia bracket which attaches the gutter into the fascia board. Another type is the spikes and ferrule system where a spike is driven directly into the gutter. It is inexpensive and easy to install but may loosen over time. You may also opt for a hidden gutter bracket, a popular choice for people who wants to make their gutter aesthetically pleasing. How can I maintain my gutter brackets? Since brackets bear the weight of the gutter load, you should look for signs of wear and tear that results from it. Spikes and ferrules are also prone to loosening so check if each individual spike is still attached tightly. If your gutter brackets are metallic, check for signs of rust that may further weaken your gutter system. A gutter bracket inspection should be included in your routine gutter maintenance. Easy Fall Guttering has created a specialised guttering system guaranteed to withstand stress from rainwater and other elements all year round. We have created a functional gutter bracket that doesn’t only support the gutter, it also helps the gutter attain the correct fall needed for efficiency. Let us help you solve any gutter problems with our innovative gutter products, leaf guards, and gutter systems. For the trusted guttering Sydney solution, call our gutter experts on 1800 897 444.